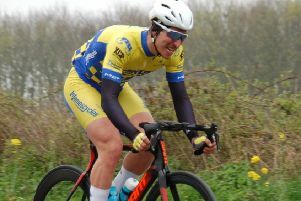 The points and impressive results keep rolling in for riders from Staveley-based cycle racing team. The Andy Moore Autocentres-JEJ Racing Team are continuing to enjoy a productive season. Another solid week of consistency has produced yet another result for an on-form Nick Moore. Ably supported by team-mates Andy Bishop and Aaron Chambers-Smith, Moore put in an impressive session to bring home the points for the team from Staveley. With squad members Joel Candy and Adam Turner rested for the week, tactical changes were necessary to maintain recent good form, and manager Andy Moore instructed Worksop’s Andy Bishop to ramp up the pace early in the race, hoping that the pressure would minimize the risk of attacks and further enable a points-scoringfinish. Bishop proved strong throughout, and at one point looked to be in with a chance of forming his own breakaway group, but with the main peloton keeping an eye on possible attacks, especially with Bishop’s recent win at Birmingham fresh in the memory, it always looked likely to end in a bunch finish. This proved to be the case, and as the last lap gallop got underway, it was Moore who found a way through, steering himself in to a fine ninth position, with Chambers-Smith in close attendance and Bishop just behind.